On Saturday, April 28, 2018, the Heatherdowns Country Club was transformed into a gathering place for nearly 200 naturalistas from across the region. Whether a business owner like Natural Needs from Indianapolis or a Curlfriend from Detroit, it was an experience to remember. Each VIP guest was welcomed with a quick digital check in and her amazing swag bag filled with goodies from Curls, Thank God I’m Natural, Keracare, Oyin Handmade, Sincerely Naturalista, and Optimistic Movement, to name a few. Even if not a VIP, there was an option to get a mini swag bag upon entry. The grand ballroom of the venue was the heart of the event where a delicious spread of soups, salads, sandwiches and desserts were available as guests listened attentively to the keynote address by Urban Farmer, Sonia Flunder-McNair. She dropped nugget after nugget of useful knowledge that had attendees taking notes and inquiring further after the keynote hour. McNair shared her experience during her youth of having her hair cut, to dealing with a health crisis that could have been terminal had it not been for her researching naturopathic ways to heal. In her experience, she used clean eating and herbal blends to reverse the damaging effects of an illness, to enhance her life and boost her energy. She now has an energy that has her planting seeds all around the community. Her work in her own yard has stretched further and further throughout Toledo to include schools, community centers and clubs such as the Woodland Garden Club and the Urban South Youth Farmers Market. Her passion for teaching others about gardening has inspired many others to begin small gardens in their homes as well. Following the dynamic keynote address, an esteemed panel addressed some deeper issues regarding hair health, self awareness, self esteem and finding your own brand of beautiful for every situation. Noting that it is important to still seek doctor approval, nature’s medicine was first and still is leading the way in healing the simplest of ailments like the common cold or allergy flare ups. With hair loss being a major issue for African American women, the panel took the most time addressing the stages of acknowledgement to action towards regrowing hair that was lost, if possible. Master barber Tawann Gaston was able to speak to the proper ways in cutting hair that is thinning and in need of a flattering shape. Gasps from many guests were heard as it was mentioned that barbers are the first stylists trained in cutting, trimming and shaping natural hair. This knowledge is out there, but not typically shared when women are seeking style options other than straighteners and extensions. Barbers don’t require straightening to create a design for men and women alike that they can wear both curly or straight. Gaston, owner of the now-expanding Groomed Toledo barber and beauty salon, is noted for his work with Robert Easter and Bishop Rance Allen, among local celebrities. He takes his work seriously and is meticulous, which was eloquently displayed as he answered panel questions. Balancing out the panel between the medical and professional approach to natural hair health and growth were panelists who could speak to walking in confidence in your own skin with your own hair. Model and teacher Meeche El focuses on African Diaspora in all that she does. Her knowledge of culture and awareness of self has created a confidence that radiated throughout the country club. Naturalistas gathered around her for photos in her handmade Afro Centric garments as she shared her love and connection with the Motherland. Her advice to young ladies was to be who they are, naturally, embracing their uniqueness. She stated, “It doesn’t matter if the world accepts you, as long as you accept yourself.” These words rung true and were echoed when TiAnna Anderson of Anderson Innovative Marketing was asked about being black and natural in the workplace. While it is important to check your workplace handbook, it’s still okay to be yourself, whatever your brand of beauty is. Both ladies shared the idea that regarding oneself in high esteem builds confidence that is not easily shaken should discrimination arise. Anderson is a naturalista and entrepreneur who works with local beauty business owners in creating content that tells their stories while setting their brand apart from others in a saturated market. Her work with local businesses inspired her to create Ready, Set Aim, a conference that is geared toward further equipping women business owners with tools and skills they need to succeed. Her expertise during the panel was a welcomed gem for attendees even if they don’t have a business because we all can have our own brand of beauty. The room was full of professionals like teachers, human resource managers, authors and aspiring business owners, some of which said they will return to GCNHS next year as a business owner and vendor. This story is one of the many reasons that I, the founder, continue to host these types of events. The inspiration is contagious. A new vendor in the marketplace attended The Ohio Natural Hair, Health and Beauty Expo twice before starting her own business Natural Vibe, and she was well received by guests as were all of the vendors. Curlfriends were networking, sharing videos, pictures, snapping selfies and buying the handmade and unique hair and skin products along with amazing accessories such as Headwraps by Sharmen. 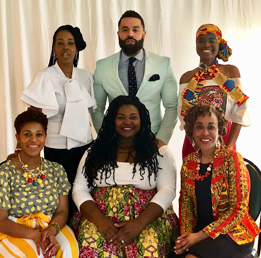 The Glass City Natural Hair Symposium was more than just shopping and listening to speakers. There was an engaging experience that offered education and interaction with all guests throughout the day. The University of Toledo student organization, Natural Hairitage operated the Young Naturalistas room where they had deep round table discussions about Black hair, current culture, and society’s impact on beauty standards. In addition, there was a DIY lab where naturalistas could make their very own sugar scrub or organic hair conditioner using everyday kitchen ingredients; and people could share their feelings about their hair by writing them on the Black chalkboards throughout the space. Daily Downtown host, Brigette Burnett, attended the symposium and shared in the joy of natural beauty, creating a stunning recap of the event that can be seen on the Promedica jumbotron downtown. Anointed Photography took photos and had them available for guests on the spot, which gave them just one more memento from the event. Other Engage activities included a game card where guests could mark off what they have done during the day from live head wrap tutorials by Jeanette Martin or attending the talk from author Celia Gold who penned her hair experience in a book entitled “Hair Fairy, My Angel”. There were InFROstations that described necessary tools for naturals and caring for children’s hair, and one of the sponsors, Optimistic Movement, who also created the labels for the newly established Natural Vibes business, conducted giveaways at their booth. The networking was real and truly a breath of fresh air. Seeing Black men and women engaging customers, sharing knowledge, supporting each other and loving each other was more than one could have imagined for an event like this. It was classy, curly and cultural wrapped beautifully, and adorned with a bow. There was so much positive energy permeating throughout the Heatherdowns Country Club that even the owner stopped in and was taken aback by the transformation of their venue. From the friendly and attentive staff to the very beauty of the green backdrop the venue provided, GCNHS was nothing short of wonderful. As post event comments are still being made and shared, me and my sponsoring company, The Kitchen Salon, have plans for next year underway. Follow thenaturalexpo.com to see photos from this year and to learn how to be a part of GCNHS next year.